Today I have for you a new to me blogger!! Bellini from @beautybella7 has a super cute style and she can definitely rock nubs!! Let’s see what she prepared for us! I’m Bellini from @beautybella7 and I have the honor of doing guest post to for Monica a.k.a @monismani. This is the first time I do something like this and it is so fun. I hope I get more opportunities in the near future. Thanks so much for having me darling. I hope your surgery goes well and you recover at a lightening speed. I will miss those beautiful manis of yours. I will be sharing the very first design I created since I became one of @SensatioNail 2016 Ambassadors. I used most of their products for this look. I hope you all like it. – Gently remove the shine off your nails, using a 280 grit file. Be very gentle. – Use a nail cleanser to remove any dirt and debris from the nail plate. – Apply the gel primer to your nails. There not need to apply it to the entire nail, you can just outline it. Let air dry for about 30 seconds. – Gently shake the gel polishes before you use them. Apply a thin coat of gel strengthener (or gel base coat) and cure for 30 seconds in the SensatioNail 3060 LED lamp. – Apply twin thin coats of yellow gel polish (Beat The Heat) and cure each coat for one minute. Remove the tacky later with alcohol and a lint free wipe. 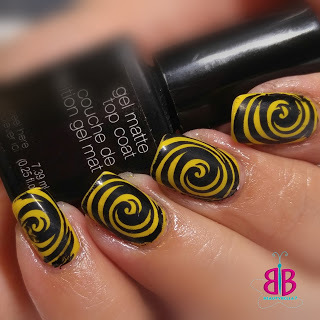 – Apply liquid latex to the skin around your nails for easier clean up when stamping. – Stamp the wartermarble image number…. using a black stamping polish and the stamper of your choice. Repeat this step on all your nails. Once you finish, remove the liquid latex. – Apply a thin coat of regular top coat and cure for 30 seconds. Follow with a thin layer of matte gel top coat and cure for 30 seconds. – Lastly, using either alcohol or a gel cleanser, remove the moisture layer from the nails. Thank you so very much for reading through my extensive ‘tutorial.’ I would love to meet all of you. Come visit me. I am leaving my info below. Love the mani Bellini! thank you so much for helping me out!! It was a pleasure helping out Monica. Thank you so much for this opportunity. Te esperamos con brazos abiertos!